The Delta Everly Bath Collections defined edges and elegant twist will add a distinct silhouette to grace your bath. The transitional design compliments a variety of bathroom styles from traditional to modern. Everly also features SpotShield Technology which means less water spots, less cleaning and antimicrobial protection of the finish. The included pop-up drain with unique Worry-Free drain catch helps to ensure valuables dont wash down the drain. The MOEN Adler Single-Handle Low-Arc Bathroom Faucet is efficiently designed to meet WaterSense criteria, conserving water while maintaining peak performance. A single-lever design ensures easy use, while ceramic disc valves help further reduce water waste. The innovative Spot Resist finish in brushed nickel resists fingerprints and water spots to maintain its original brilliance and easily wipes clean, keeping it looking great over time. Bring a sleek, timeless look to your bathroom with the Banbury 2-Handle High-Arc Bathroom Faucet from MOEN. Its spot-resistant brushed nickel finish resists fingerprints and water spots, offering versatile style for both classic and modern decor. The separate lever handles for hot and cold meet ADA requirements for easy use and the faucet is WaterSense certified to help conserve water without compromising performance. Everly 4-inch Centreset 2-Handle Bathroom Faucet in SpotShield Brushed Nickel The Delta Everly Bath Collections defined edges and elegant twist will add a distinct silhouette to grace your bath. The transitional design compliments a variety of bathroom styles from traditional to modern. Everly also features SpotShield Technology which means less water spots, less cleaning and antimicrobial protection of the finish. The included pop-up drain with unique Worry-Free drain catch helps to ensure valuables dont wash down the drain. 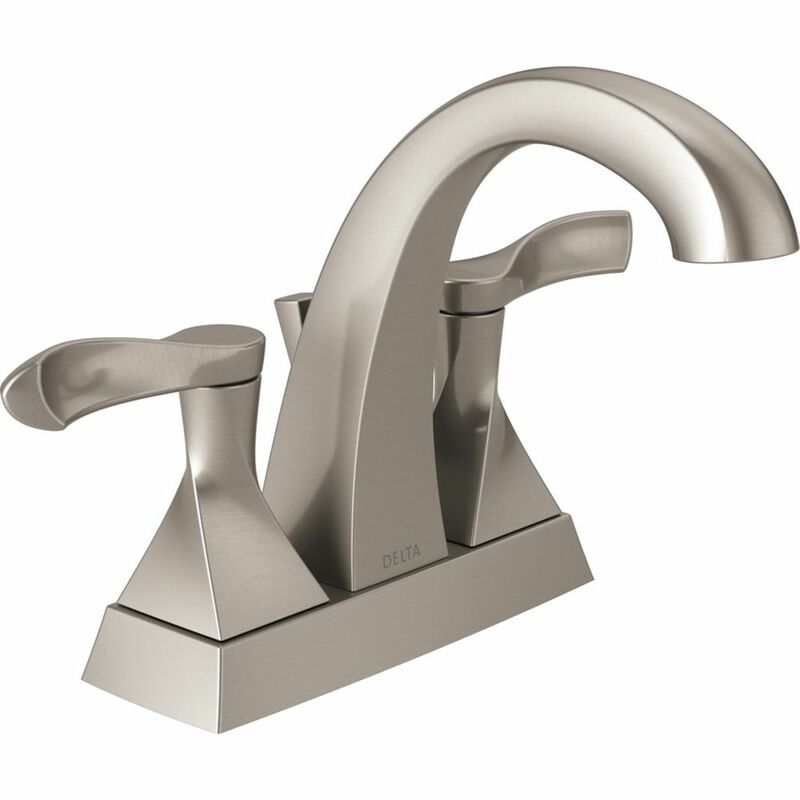 Everly 4-inch Centreset 2-Handle Bathroom Faucet in SpotShield Brushed Nickel is rated 4.4 out of 5 by 139. Rated 5 out of 5 by David from Easy to install, looks great. Recommend to buy. ... Easy to install, looks great. Recommend to buy. Rated 4 out of 5 by Raymond from I love the look of this faucet!... I love the look of this faucet!